The first weekend in March (March 5-6), Alex and I spent the night in Sankt Goar, inmitten der Schlösser. It was recommended to us by Mr. and Mrs. Sauers, who had ventured there when they came to Deutschland to visit in Oktober. They spoke highly of the family-owned Hotel Rheinfels and the Burg Rheinfels on the mountainside above the town; we couldn't be happier with their recommendation. Sankt Goar is a small town (no grocery store for Urlaubsnacks small) along the Rhein about one-and-a-half hours south of Köln mit dem Zug. The train ride is lovely, most of it spent winding south along the Rhein into the mountains of the Loreley. With just about every bend in the river, you find another castle perched on a mountainside. (Here, the German language gets a little fuzzy because one of the words for castle is Burg and the word for mountain is Berg; the difference in pronunciation is quite subtle, especially for a non-German!) All of these Bürge are in different states of ruin—some look as if they were built within the past several decades while others show their old age by having fallen into disrepair and even ruin. Across the Rhein from Sankt Goar are two rival castles in the neighboring town of Sankt Goarhausen—Burg Maus and Burg Katz. Burg Maus was built sometime during the 1350s and was completed within one to five decades. When it was first built, it was given the name Peterseck by the Archbishop Boemund II of Trier. Peterseck, however, was surrounded by foes in securing the right bank for Trier. Burg Rheinfels, on the left bank above Sankt Goar, was allied with Neu-Katzenelnbogen, built around the same time as Peterseck a few kilometers upstream on the right bank to the south. Burg Maus in the distance on the right bank of the Rhein. The lengthy name of Neu-Katzenelnbogen—roughly "New Cat's Elbow"—was given the nickname of "Katz". Consequently, Peterseck was jokingly renamed "Burg Maus" because die Katze frisst die Maus. However, the nicknames Burg Katz and Burg Maus have stuck around. Burg Katz on the right bank of the Rhein, just a few kilometers upstream from Burg Maus. 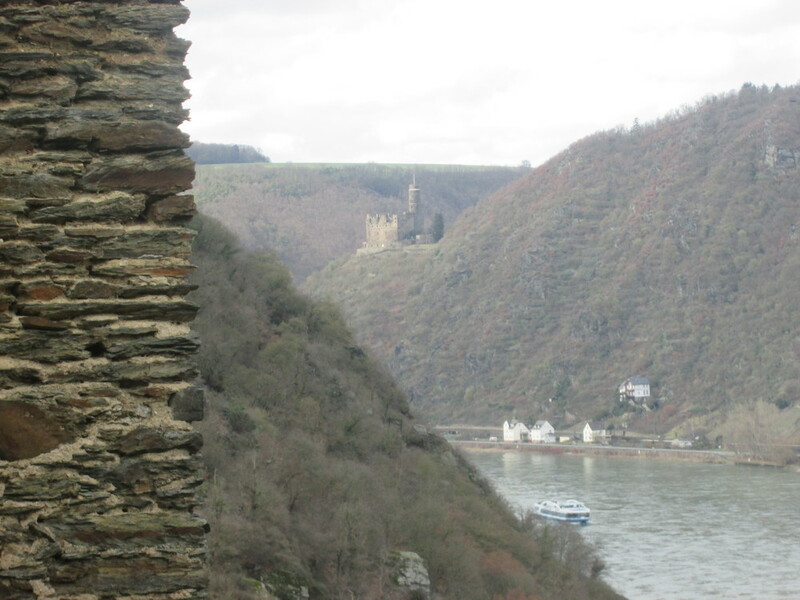 Because Burg Rheinfels is just above Sankt Goar, Alex and I were able to hike up to it. We wound through the town and up the mountainside a few kilometers, getting an upclose view of the castle ruins. Because we visited in early March, the hours for touring Burg Rheinfels were limited for the off-season, and we were unable to enter. However, we still were able to get a magnificent view of the crumbling walls and tall towers still standing. It was amazing that, despite parts being in ruin, the castle still stood strong after hundreds of years. The magic of the weekend was not limited to the view of castles. We stayed at the Hotel Rheinfels and opted for the waterside view, complete with a balcony. From there, we could not only see all three castles, but we could watch as barges made their way to and from Köln and the ferry criss-cross the Rhein, connecting Sankt Goar to Sankt Goarhausen. Being in the off-season, we had the entire hotel to ourselves, except for the Sangha family who owns and operates the hotel. Because of this, breakfast was not served in the typical buffet-style; rather, Mr. Sangha himself served us. He even made us scrambled eggs Indian style with curry. It was delicious! Sankt Goar was a perfect and peaceful getaway (especially in anticipation of traveling to Leiden (the Netherlands), Hannover, Berlin, and München in the coming weeks), especially to see German Bürge in the German Berge.